Note: Dynamic variations indicate a short-term departure from steady-state conditions. 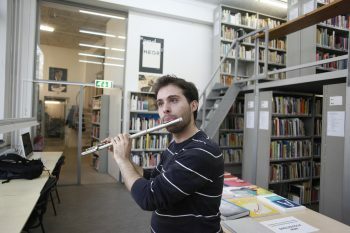 Site-specific intervention (1) acted out at the van Eyck Academie Maastricht + printed matter (2). A collaboration with Yamini Teresa Prabhu (piano), Anneleen Bruninx (clarinet), José Luis Pérez Torrecillas (French horn), Yannis Manolis (flute). Graphics: Dongyoung Lee. The van Eyck artists’ building (studio programme for visual artists, writers, designers, performers) and the Music Conservatory of Maastricht are situated opposite each other, alongside a square. 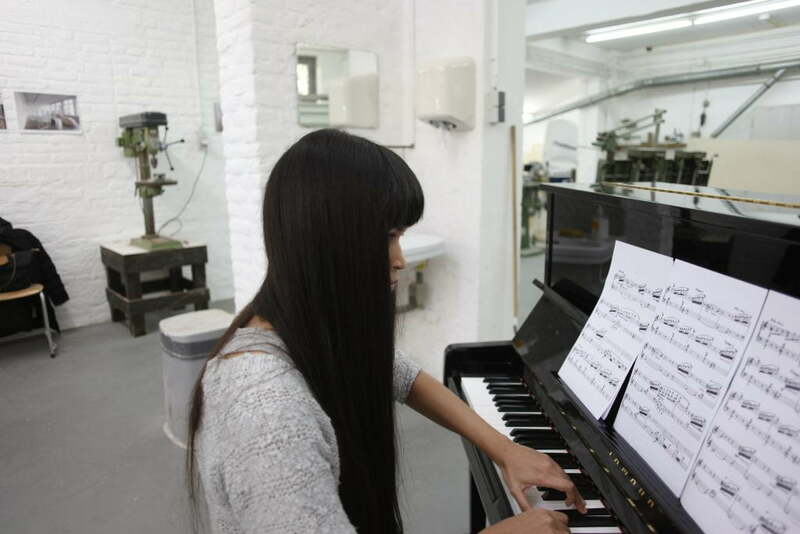 The artists working in their studios were exposed to unintentional scores formed by various instruments of the music students simultaneously rehearsing. The sounds echoed distinctly in between the intermediate space of the two buildings. Four music students were invited over to the van Eyck side, to have them rehearsing1 for once inside the operating van Eyck ‘factories’ (wood- metal2-, printing workshop and library) in order to witness and experience how the acoustics (spatial qualities) and dynamics3 altered, going from mezzo-forte into fortissimo, from an exterior dialogue into an interior one. A music notation/graphic score book4 was published alongside this intervention, and slipped underneath the studio doors of the residents at the Jan Van Eyck to accompany the making of ‘dynamic works in motion’. 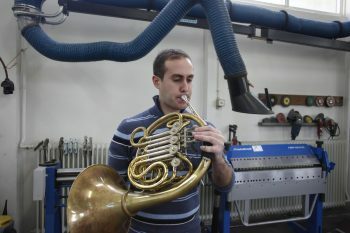 José Luis Pérez Torrecillas rehearsing the piece ‘Dialeg’ for French horn in the metal workshop at Jan van Eyck, 2014. 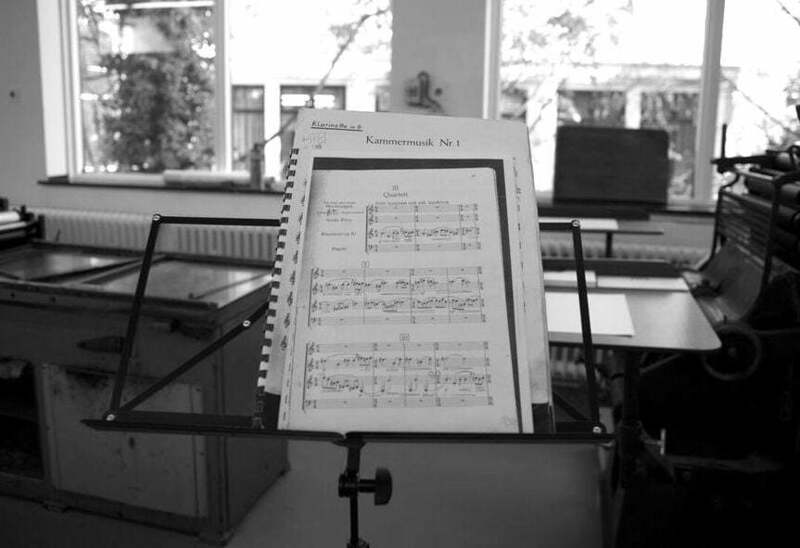 Kammermusik No.1 by Paul HIndemith for clarinet, rehearsed by Anneleen Bruninx at the printing workshop, van Eyck, 2014. 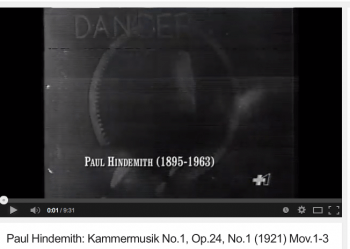 Yamini Teresa Prabhu, Kammermusik No.1 Hindemith at the wood workshop, van Eyck, 2014. 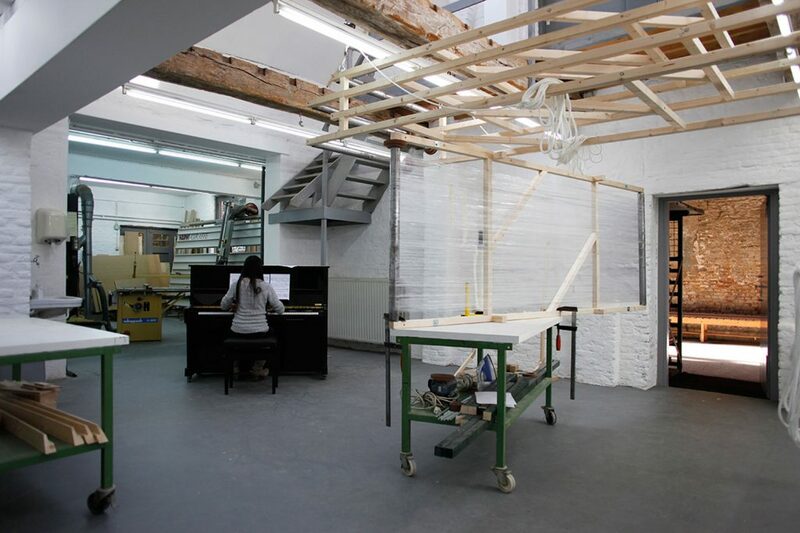 Overview wood workshop with piano, 2014. 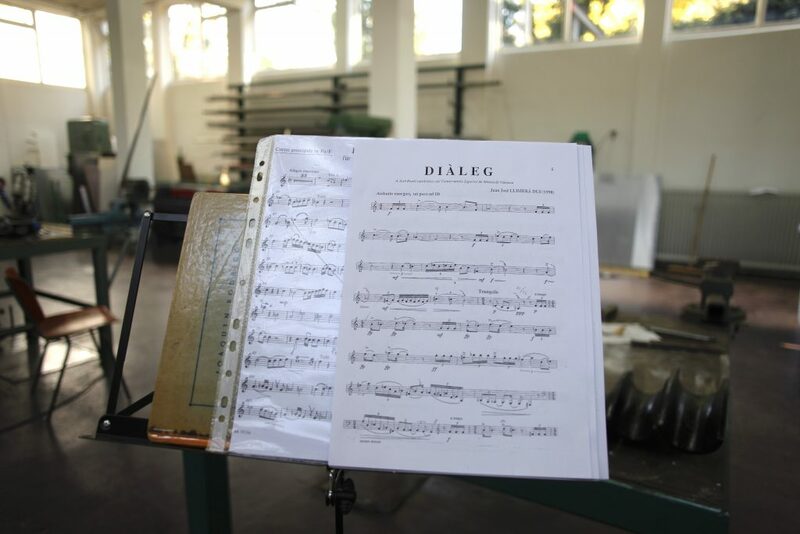 The piece ‘Dialeg’ by Vicente Llimerá Dus, 2014.